A couple months ago I was contacted by a small company in San Francisco who was bringing a new bake-at-home product to the market. Matisse & Jack's is trying to enable busy, but health conscious people with an alternative to the shelf-stable (and pricey) energy bar. Their solution? TrailBlaze Bake-At-Home Oatmeal Energy Bars that are quick and easy to make, are made of organic and non-GMO ingredients, and have the same nutritional properties of a Clif Bar. I test bake two batches and have tasters evaluate these new energy bars. Each box contains a dry mix of whole grain rolled oats, oat bran, soy protein, soy nuts, and evaporated cane juice as the main sweetener. The Cranberry Walnut flavor (pictured throughout this article) has (you guessed it) dried cranberries and walnuts, while the Chocolate Chip flavor has chocolate chips. Each 12 ounce box makes 9 bars (although bars can be cut to different sizes and shapes). The instructions are clearly laid out on the back of the box. Easy - Just preheat the oven to 350°F, mix the contents of the box with one of the possible wet ingredients listed on the box, spread into a greased pan and bake for about 30 minutes. The box lists three possible wet ingredients (which you must supply out of your pantry). 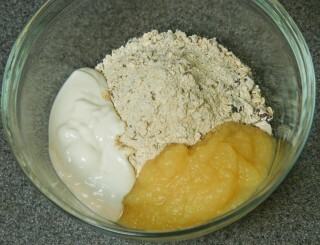 Original is 2/3 cup applesauce and 1/2 cup vanilla yogurt. Vegan is 1 cup + 3 tablespoons of applesauce and 1 tablespoon of water. 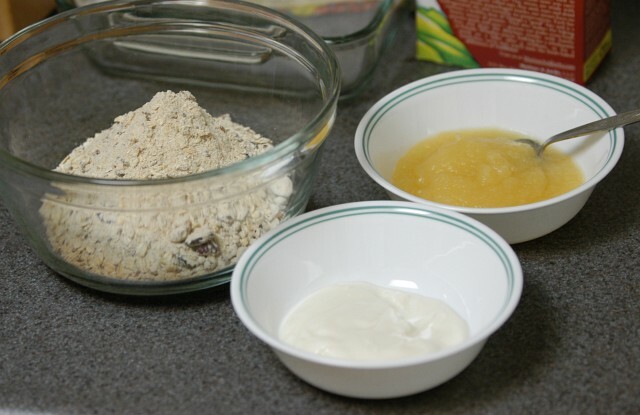 Finally, Less Sweet is 1 cup + 3 tablespoons of plain yogurt, 1 teaspoon of vanilla extract, and 1 tablespoon of water. To test the energy bars, I opted for the Original set of wet ingredients. 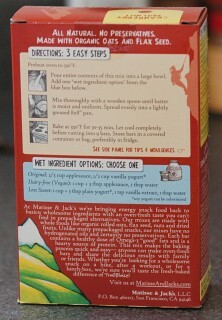 I used Trader Joe's unsweetened applesauce and Trader Joe's French Vanilla Yogurt as recommended by Matisse & Jack's. I placed all the ingredients in a bowl and turned on my oven to preheat to 350°F. 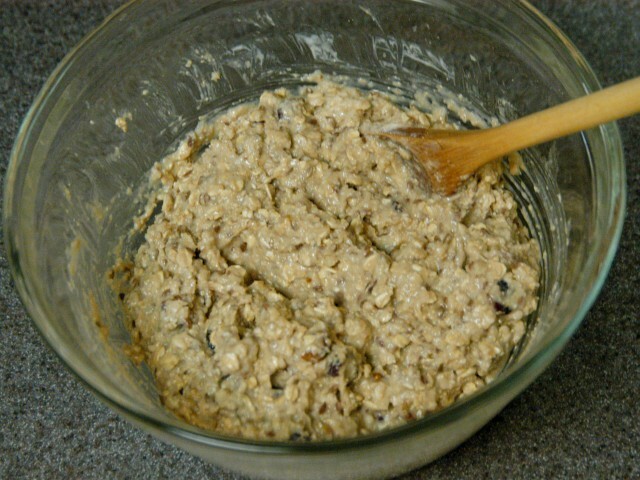 I then mixed it until the ingredients were uniformly moist. Instead of using a lightly greased pan, I opted to cut a piece of parchment paper and line my 8x8-in. pan. I used a little butter to keep the parchment paper in place. 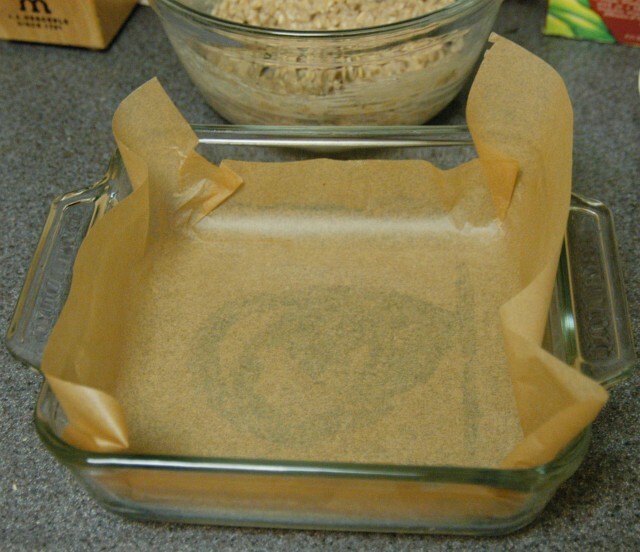 Using a piece of parchment paper like this lets me easily remove the baked good from the pan for cooling. I then poured the mixture into the pan and leveled it with a spatula. All this took about two minutes. So I had to wait for my oven to finish preheating. Once it was preheated (and I had watched some TV), I placed the pan into the oven and let it bake for 30 minutes. Once fully cooled, I cut them into nine squares. Each square, when prepared in this manner, is supposed to have 180 calories, 4.5 g fat (1 g saturated and 450 mg of Omega-3), 130 mg sodium, 22 g carbohydrates (10 g sugar and 3 g dietary fiber), and 9 g protein. The consistency of the bars was the biggest surprise to me and my tasters. The picture on the box makes the bar look like it's supposed to be dry and possibly crunchy. The bars are actually fairly moist and chewy - much more like a dense cake, nut bread, or other baked good than an energy bar. After baking both batches, I verified with Matisse & Jack's that this was indeed the correct texture and desired outcome. They said it was and they are working to get better cover photographs for their boxes to more accurately represent the product. Of the tasters, all but one preferred them over the regular store bought energy bars. The one dissenter said it felt too "healthy" and didn't taste or feel like an energy bar. I guess that's good news for Matisse & Jack's because they were going for a new taste and texture - but it could be surprising to the other consumers who also have set expectations of what an energy bar should taste like. 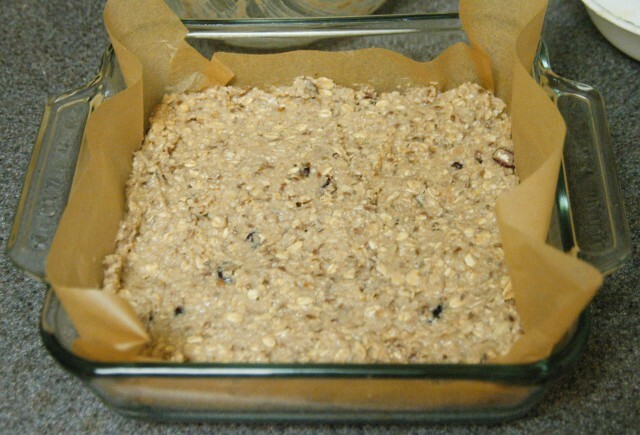 The texture was very well received by the other tasters who commented that other energy bars are just "hard" compared to these Oatmeal Energy Bars. Personally, I felt that the taste was the highlight of the product. The sweetness was just right to make the bars tasty without being overly sweet. The proportions of fruit and walnut pieces (or chocolate chips) were just right to balance the taste and texture of the oats. 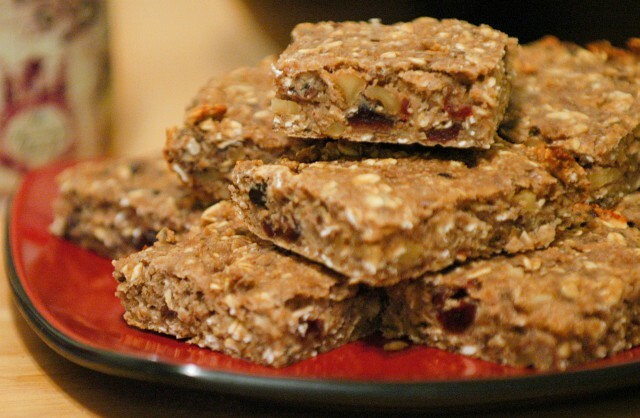 I didn't think of it as an energy bar - it was a really tasty breakfast bar. They reminded me of the Quaker Oats Chewy Granola Bars. So, I went out and tried a couple Quaker Oats bars to see if they really did taste alike. There was no comparison. The Quaker Oats bars were so loaded with sugars and sweeteners (which I believe must be how they keep the bars together), that I almost couldn't stand it. 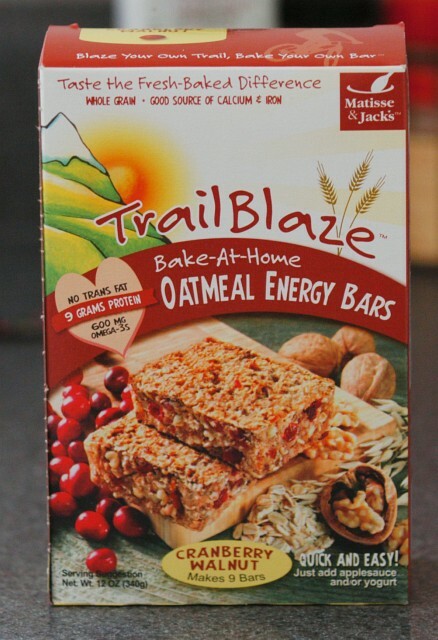 There really wasn't much similarity between the products, and I found myself craving more of Matisse & Jack's TrailBlaze Oatmeal Energy Bars -- which says a lot about the product. My only problem with it? It's not cheap. At $6 a box in stores (sold at Whole Foods Markets) and $5 if purchased from online, it's a bit more expensive than cereal. But, for a product with organic and non-GMO ingredients, it's quite competitively priced - especially if you consider that each bar costs just about 80 cents (when you factor in the applesauce and yogurt). If you like to eat protein bars or want a quick nutritious afternoon snack, this is a product worth trying out. 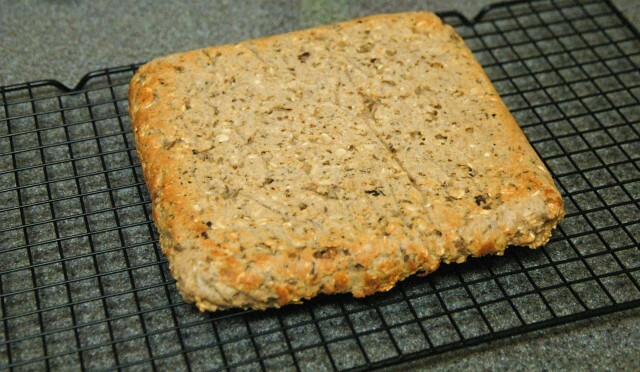 The time investment is fairly minimal (about 5 minutes of active time, with 30 minutes of baking and a couple hours of cooling), it is as easy to make as they claim, and it tastes really good. Only slightly less convenient would be taking one of the three recipes from Good Eats. Alton did recipes for brown rice crispy treats, a granola bar, and a protein bar. Recipes here and trasncript that includes nutritional info here. Michael, were you paid to run this article? Nope, but I was given the mixes to try out. For future reference, If I'm ever paid to promote something, then I mark it as advertising. If I recall, this has happened only once in the main articles when I promoted Iron Chef America and made it clear that I was being paid for the pitch. I also asked for forgiveness in that article. I haven't done it since. I do get free samples to try out of products and am (in my mind) as fair as I can be when I approach the review. Sometimes, I read about the item and I go buy it, sometimes I ask the vendor for a sample, and sometimes the vendor contacts me. In this case, Matisse & Jack's e-mailed me (and I'm always a sucker for the small startup looking for help from other small startups). They sent me two boxes of the mix and I sat on it for about a month. Then I ran the tests back to back, wrote down all the notes (and kept all the photographs), and sat on it for another month. Then I sat down last night and wrote up my experience based on my notes. There have been times when I've tested a product and felt it wasn't very good - but, in those cases, I talk to the vendor and they either explain what the products intended purpose is and I reevaluate or we agree that it's best that I not publish the article. Since I've only done a few product reviews so far, I haven't had the problem of deciding whether or not to publish a really crappy review. I'm not out here to hurt others, just provide food info, recipes, and a look at some products others may have not had a chance to try out. Michael, thanks for sharing your thoughts on the issue. I'm relieved to see that it's something you take seriously, and that you try to do the right thing. 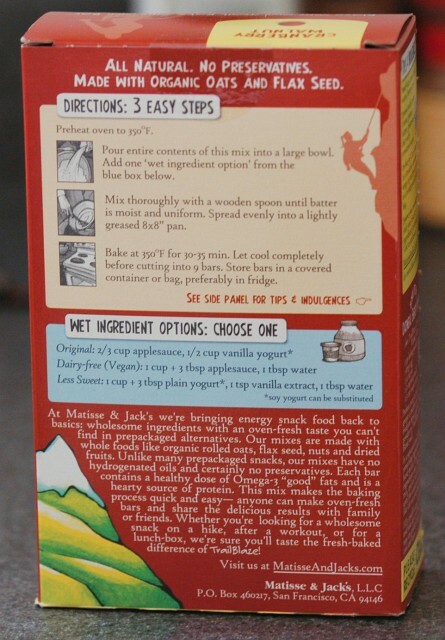 Back on topic, your review of Matisse & Jack's TrailBlaze Bars was serendipitous because I'm a Clif Bar junkie. :-) I order them in bulk, but they're still expensive, and they tend to get stale by the time I'm through a case. I've been looking for a decent at-home substitue, and the TrailBlaze Bars look very promising. I think they would be more economical, and could be prepared in smaller, fresher, quantities, so I've already ordered a box, and plan to give them a try. Hmmm. I'll have to try these. They would make tasty on-the-run snacks or breakfast. However, I think I am going to tinker around and see about baking them in a loaf pan and then cutting them across to form "bars". That was an unsuspecting kid might well think they are the sugar-laden junk bars we find in the mega-markets. 1)I thought you did a fine job of being up front that you were given the product to try, and if you continue like you did here or with the Iron Chef post, I for one won't have any problems. 2)I agree that the Alton Brown Bars were my first instinct when I read this. If you ever get a chance to run a side by side of them, I'd be very interested to see that. Any chance there's a non-soy version in the works? Would you explain to me what soy nuts are? Soy nuts aren't common in American kitchens either, but they are available in specialty stores and supermarkets catering to the higher end customer. Basically, they are just soy beans that have been soaked (in water), then cooked in an oven until they are mostly dried out and crunchy. I just got some last week and these things are the best ever! Definitley recommended! I may end up just messing around with ingredients in the Good Eats recipes, but another recipe to compare to would be great. lots on the RecipeSource website www.recipesource.com, use their search facility to look for granola bars, they have 27 recipes. I too just recently saw the Alton Brown episode where he makes the granola bars homemade and they looked great. I liked the point he made about the huge decrease in sodium when you make them yourself. The bars you made here look really good, but I think if I'm going to go to the trouble of making them myself, I'm going to go ahead and make them from scratch and not a box.